Every year we look forward to a new year because that is when Pantone announces its official color of the year. This year they chose the very bright Living Coral. This is the perfect pinky-orange color that we’ll be seeing a lot of in 2019. We’re so excited to use it in wedding bouquets, floral arrangements and décor all year long! Pantone describes Living Coral as “an animating and life-affirming coral hue with a golden undertone that energizes and enlivens with a softer edge.” We couldn’t agree more. This unique shade is so fun and easy to bring into your home. Here’s how we’re using it in the shop right now. 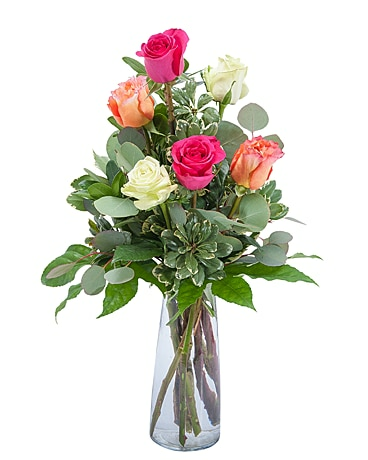 A twist on the classic, this six rose arrangement incorporates different color roses. Most importantly, we incorporate coral roses to go along with the color of the year. This makes the arrangement a little more playful, perfect for friends! 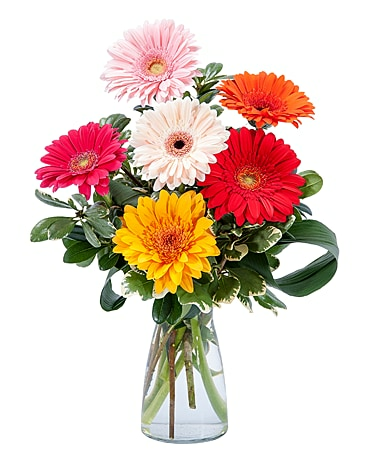 Bright and fun, this gerbera arrangement doesn’t disappoint! We love this arrangement for many reasons, but one of the best things about this one is that it’s perfect for so many occasions. This is going to be a hit at all 2019 birthdays and parties. Contemporary, stylish and coral! One of our modern arrangements incorporates all coral to perfectly encapsulate the color of the year. With Valentine’s Day right around the corner, this is the perfect gift for your special someone. Celebrate a new year, and a new color, with Rosemary Duff Florist in Escondido. We offer convenient, online ordering for all of our arrangements, plus same day local delivery. Visit us online to customize your flowers today!